Basketball players, like the religious, look heavenward periodically. During a losing streak, the sports world’s closest approximation of the essence of this disintegrating life, these glances gather the increasing gravity of supplication. If you were unfamiliar with basketball and came upon this photo of Mike Gminski looking up, you might guess that he was praying for some kind of a sky-born rescue. But of course he’s not looking at the sky, or even at the domed ceiling, but at the large digital mechanism that shows the score and the game clock. Most of the time, we’re not so desperate as to ask for supernatural deliverance. We simply want to know if there’s any hope. As an expert of sorts in this regard, I can guess with some degree of certainty that the answer to this particular silent voicing of the question by Gminski was a fairly emphatic no. It’s not just that Gminski was suffering through a relatively dismal 58-loss season at the time of this photo. It’s his dazed and slightly melancholy expression and the slight stoop in his posture, as if he’s not altogether sure that the scoreboard with the demoralizing Time and Score might join the ode to the law of entropy of another Nets loss by coming loose from its moorings and crashing to the ground. And I may well be projecting this, but Gminski even looks as if he may be checking the clock to see how much longer he has to endure the pain of the beating. I know what it’s like to long for the thing to be over. In the fall of 1981, when I got this card, I had been playing basketball for a school team for two years, and I had experienced many an on-court slaughter. I was in the ninth grade, and had gone through a winless seventh grade season and an eighth grade season that was in some ways even worse. It was worse mainly because it was by and large more of the same, further defining me and my basketball-playing classmates as somehow hopelessly deficient. Also, the seventh grade team challenged us to a game and beat us. And then there was the end to our losing streak. Don’t get me wrong, when we finally ended the long skid of losses that stretched from the fall of 1979 to the winter of 1981, I was so happy that I didn’t know what to do with myself. I mean this last part literally. At the buzzer I whirled and slapped a teammate in the stomach, making him wince momentarily before half-jokingly raising a fist to me like he was going to pay the slap back with a right cross. It was a brief sour note. Later that night, back home, alone in my room, I cut a lock of my winning hair and taped it into my diary. I wish I still had that diary so that I could see if I wrote anything about my part in the win. I can’t remember doing anything beyond my usual directionless on-court meandering, except for, near the end, waving my arms around frantically to distract the guy I was guarding from making an effective in-bounds pass. My efforts in that case didn’t lead to a turnover, as far as I can remember, and in general the win seemed to just happen, beyond any personal influence. As the losses resumed, the one win ceased being a possible end to our ongoing descent and instead just hung there in memory as an inexplicable temporary deviation from loss that I had floated around within, as incorporeal and inconsequential as a ghost. 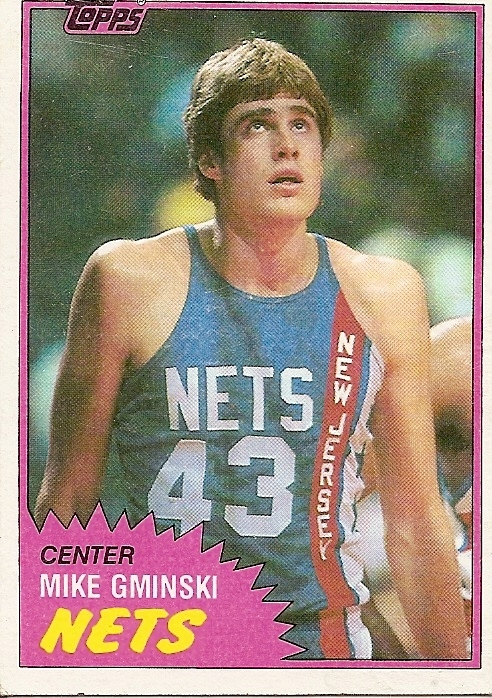 Mike Gminski’s Nets descendents finally won a game a few days ago, their first of the season after 18 losses, but then they followed that win with another loss. The story of their historic incompetence has dissolved, leaving only the day to day apprehension of the Scoreboard in the Sky. How are we doing? How much time is left? Is there any hope? Look how you the G-man is in this Photo. Wow, I forgot he was ever this young. To me Gminski always had that beard. The sad thing about the current Nets is that it didn’t have to happen this way. Bruce Ratner screwed the team right when they were starting to build some huge fan support. But he wanted his Brooklyn deal so there you go. What’s really crazy about their current situtation is the best case scenario for them to ready to play in Brooklyn would be the the 2012-2013 season. So they still have 2 1/2 years left in Limbo. I think originally they were suppose to be in Brooklyn for the 2007-2008 season. I went to NC State when Lorenzo Charles was there. He was allegedly 6’7 but he was just an inch or two bigger than me. But whatever they list Gminiski at, he’s that tall. Easily the tallest guy I’ve ever stood next to and that’s with him kind of stooping over. Anyway, Gminiski is now a college basketball analyst and a pretty good one, too. You went to school with Lo-rilla (and, presumably, Co-rilla)?!? A key piece of info would be how tall you are. I’m interested to know how tall the author of perhaps the most famous dunk in NCAA history really is, but without that key comparative height I’m still in the dark. I was the only Nets fan I knew growing up in southwest Connecticut in the 80s. Red Sox, Jets, Nets. I mostly wore a paper bag to school.